War is hell in Graham Masterton‘s The Devils of D-Day (1979), a wonderfully succinct novel about demons taking part in the invasion of Normandy. 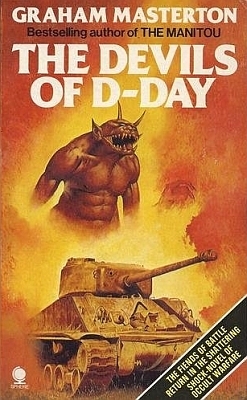 Coming a year after James Herbert‘s The Spear, a novel which similarly mixed the war with the occult, The Devils of D-Day turns the old adage of nazi black magic on its head by putting the devils into US Army tanks. 30 years after the event an American cartographer stumbles on one of the notorious black tanks on a roadside in a picturesque French village. And apparently the driver is still inside the sealed tank. For years the demon has caused occasional mischief, such as spoiling the milk and causing eggs to rot, not to mention killing some people. Can’t have such things in our pastoral village, now can we? After receiving some nudging from the demon, the American decides to release the village from its pestering scourge. With the help of a local priest a bag of dusty demon bones is recovered from the tank. But before the bones can be properly exorcised, the demon gains its true form and guts the priest and forces the American and a local farmgirl to take it to its twelve brothers, so they can call up their master, a properly demonic devil, Adramelech. And off they go, in search of the other devils of D-Day. The search proceeds without a hitch, quickly resulting in a traditional good vs. evil smackdown in a secret government facility in central London where warmongers are trying to come up with ways to use the demons as a relatively low-cost weapon. After all the demons don’t demand a payment in money, just blood. The short novel clocks in at a nice 180 pages; there are no subplots, no flashbacks or jumps in time. The novel begins with the main character and doggedly follows him until the finale in London several days later. The writing is effective and to the point, there’s no unnecessary rambling. None of the characters are fleshed out in any way, but then again, this isn’t that kind of a novel. It’s supposed to be cheesy fun and cheesy fun it is, literary quality be damned. An early work by the profilic Masterton, The Devils of D-Day also bears all the hallmarks of late 70s, early 80s horror. It’s unabashedly, traditionally Satanic; Slayer‘s early eighties albums would provide a great soundtrack if a movie version was ever made. The names of angels and demons are batted about with great abandon, and while in France you can and should of course have a priest called Father Anton, living near a town called Le Vey (sic). Satanic spells are also cast frequently, sometimes through a recording device (similar to Evil Dead movies many years later). In a note at the beginning, the author even warns not to mess around with this stuff because it’s all real. As said previously, the cheese is strong in this one. The demons themselves are cartoonish, mocking, perverse little creatures that are more childish than truly frightening. However, the novel is serious about the war, and even shows sympathy for the common German soldiers butchered by the American demons. According to the novel, the powers-that-be have utilised the demons in wars throughout history, with the demons only too happy to oblige. It’s not too far-fetched to see the demons as weapons of mass destruction similar to chemical weapons or the nuclear bomb, the latter being something that was especially prevalent in the late 70s and early 80s culture. Somebody human is always behind the button, whether that button releases demons – or something worse.